How to Select a Speaking Voice for the Speech Synthesizer in Windows Phone 8? 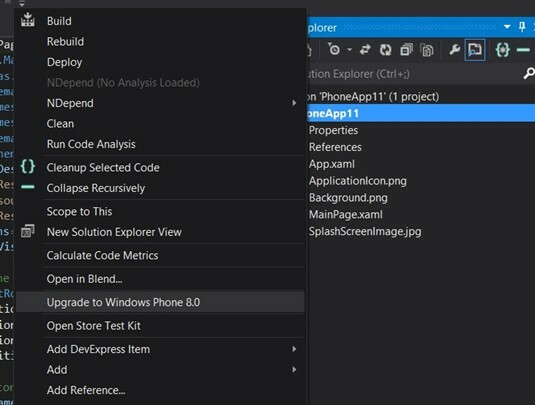 How to Upgrade a Windows Phone 7.x App to Windows Phone 8 in Visual Studio 2012? You might have already developed a Windows Phone 7.5 App and you wanted to utilize the Windows Phone 8 features in your Windows Phone App. In this case, you might be looking to upgrade your Windows Phone 7.x project to Windows Phone 8. Before doing that upgrade, take the backup of the complete soucrecode and copy it to a different folder. This is because, once your upgrade your Windows Phone project 7.5 to Windows Phone 8, you cannot revert it back to Windows Phone 7.5. 1. Launch Microsoft Visual Studio 2012 and open the existing Windows Phone 7.5 Project. 2. Right Click on the Project in the “Solution Explorer” and click “Upgrade to Windows Phone 8.0” from the context menu. Click yes, since we have already taken the backup of the old project. 4. Now, your Windows Phone 7.x project should have been upgraded to Windows Phone 8 project. For a quick check, you can verify the AppManifest file where you will see some new options like Supported Resolutions, Tiles Images, Tile Template etc. and the capabilities tab will include the new features of the Windows Phone 8.